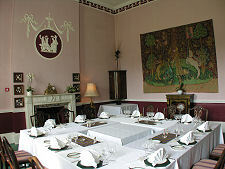 Dining at Culloden House Hotel usually takes place in the impressive dining room, complete with its plaster reliefs and Adam-inspired columns, which occupies the left rear portion of the of the main block of the hotel. An additional morning room can be used for private dining and for family groups with young children wishing to dine together. 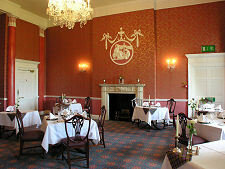 You can read our hotel review for Culloden House Hotel here. Lunch and dinner are both served by the hotel. Dinner is a journey of discovery. What you discover is just how good Scottish cuisine can be. There are two menus to choose from. The first is an à la carte menu offering a range of choices for starters, intermediates, main courses and desserts. The second is a daily changing set "Scottish Dinner Menu" offering distinctively Scottish dishes, some of which also appear on the à la carte menu. Any reference to specific dishes can only be indicative of what was on offer when we dined, but the starters of "herb and spice rolled carpaccio of Highland venison" and "Scottish smoked salmon, oak smoked and ginger cured" were equally superb. As were the intermediates of "timbale of haggis neeps and tatties" and "gin and tonic sorbet". And it becomes difficult to find superlatives sufficient to describe the mains of "tournedos of Scottish beef fillet" served with, among other things, wild garlic, and "honey glazed duck breast". The standard was maintained through the sweet course and the end result was one of the best all round dining experiences we have experienced anywhere. Culloden House has been awarded 2 AA Rosettes for its dining, but the reality far surpasses the expectations raised by this. The outstanding quality of the food itself is matched by the exceptional service, which is perfectly judged, and paced to suit the individual progress of the diners on different tables. It must be added that the quality of the food is matched by good helpings: no-one is likely to go to bed hungry. Breakfast is taken in the dining room, with all elements being served to you at your table. The outstanding quality of food and service we enjoyed at dinner was maintained at breakfast, making it one of the best we have experienced. Everything, from the obviously freshly squeezed fruit juices to the porridge was excellent. The cooked main courses included options of smoked haddock cutlets and grilled kipper fillets, or home made herb muffin with smoked salmon and scrambled egg. Plus a traditional Scottish fried breakfast it would be worth travelling a long way to enjoy. Here the menu offered a choice between back or smoked Scottish bacon, and between beef and onion or Cumberland pork sausage  the latter an interesting twist in a hotel so closely associated with the Battle of Culloden. Plus everything else you would expect, and eggs perfectly cooked to your preference. 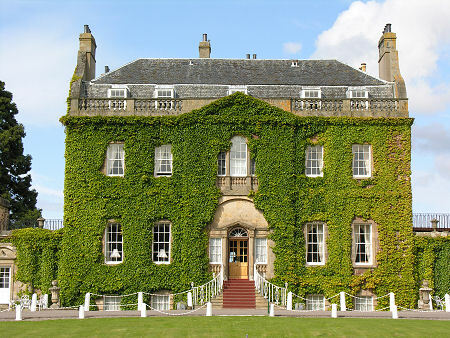 You can read our hotel review for Culloden House Hotel here.